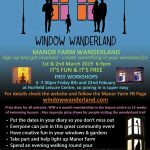 Manor Farm is taking part in Window Wanderland and we are very excited. 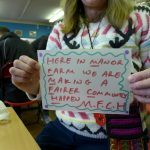 Get your creative thinking hats on and enjoy doing something to light up the area at the beginning of March. Taking part is FREE and everyone is welcome, you can make a display in the windows of your flat, house, business, school, nursery, car, camper van or shop. You can do anything you like as long as it is family friendly: it can be as small as a candle in the window or as large as a performance in your living room ( to be seen through the window) or out in a front garden, ( but please don’t forget to think about health and safety for you, for visitors and for the environment). Take a look at what past people have done and join your community together by lighting up your area. 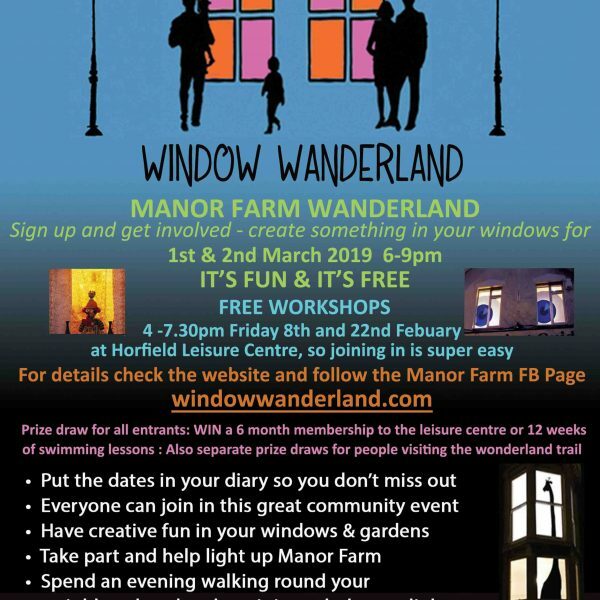 There are going to be some free workshops at Horfield Leisure Centre on the 8th and 22nd of February from 4 – 7.30 if you would like to get creative with other people, and there will be other events too so keep a look out for up dates.